The Employer Support Awards are designed to formally acknowledge those employers who recognise the benefits of employing staff who are Reservists. For the first time nationally, the Manawatu-Wanganui-Kapiti region have extended this formal acknowledgement to employers who support and employ Limited Service Volunteer (LSV) graduates. LSV is a six-week hands-on motivational and training programme for young people run by the New Zealand Defence Force. The purpose of the programme is to help young people improve their job prospects and increase their confidence. The motivational training involves outdoor recreational activities with a strong emphasis on working together as a team and the discipline it takes to achieve this. For one such LSV graduate, Renee attributes LSV is turning her life around. Renee found herself disillusioned with study and soon occupied her time with drinking and confesses to doing “nothing much” from Monday through Thursday. “I turned 21 and knew I needed to get my life together” said Renee. She completed the six week LSV program which she says helped her to mentally get and stay positive, find her self-confidence and belief, motivate herself and take a positive outlook on life. 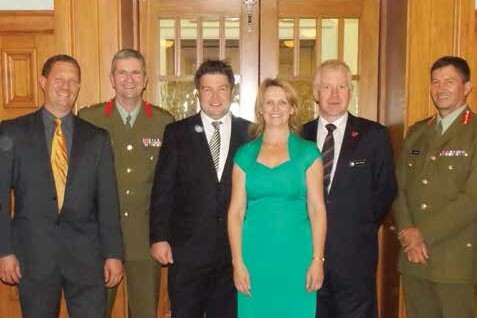 Alsco NZ’s General Manager, Mark Roberts attended the regional event and has gone on to promote the LSV programme and the benefits of employing LSV graduates and partnering with Work and Income at the company’s national conference.